Some people assert that biblical boundaries cannot be used to demarcate the area of the land the Jews are entitled to, since all the various accounts differ from each other. Knowing what one can achieve from a careful study of the scriptures under guidance of the Spirit, we though that this attitude was really equal to "throwing out the baby with the bath water"
From our analysis of the factors that could influence the eventual size of Israel, the God of Israel's inheritance, it must be clear that the safest approach to determining Israel's borders in scrupture, would be to accept "biggest" possible sizes and not an average of values or indicators. We can now procede to discuss scripture references to the size of the promised land. Jesus will be the eternal ruler in the line of David over Israel and all the nations of the world. Why would He be willing to rule from a kingdom of Israel that is smaller than that of David and Solomon? Actually, if world leaders could have their way, Israel will be left with a sliver of land along the Mediterranean Sea, a "Tel Aviv" state without Jerusalem and the Temple Mount. Bless the Name (baruch HaShem), they will not have it their way!! We have no doubt that this area, will be controlled by Israel, although some of it could comprise confederate states. Syria and Jordan will be destroyed (Isaiah 17) and Israel will have driven out Hisbullah from Lebanon and repossessed most of Lebanon - Lebanon was historically in any case not really a country per se, just a Region. Israel will have taken the Sinai back as in the map and Egypt and Iraq will most probably be confederate states that have allied themselves to Israel and her God. A by-product of Israel's victories*~* and the testimony of her God's involvement will also contribute to territorial increase beyond what Israel will acquire as spoils of war, from so-called Lost Tribes in the ME realizing their true identity and joining themselves and their land to Israel and her God. A catalyst in the process will be the proven fact by then that Allah is an impotent false moon god, unable to help his deceived followers to withstand the Israelis due to the might of their God. *~* See Isaiah 17 in "Zionsake's Prophetic Wakeup Call" and "Lost Jews/Tribes" in Scripture Keywords. We find the first reference to a territorial entity for a Jewish nation in the promise to Abram when he first arrived in the land of Canaan? Genesis 12:5 He took his wife Sarai, his nephew Lot, all the possessions they had accumulated and the people they had acquired in Haran, and they set out for the land of Canaan, and they arrived there. 6 Abram traveled through the land as far as the site of the great tree of Moreh at Shechem. At that time the Canaanites were in the land. 7 The LORD appeared to Abram and said, "To your offspring I will give this land." So he built an altar there to the LORD, who had appeared to him.
. 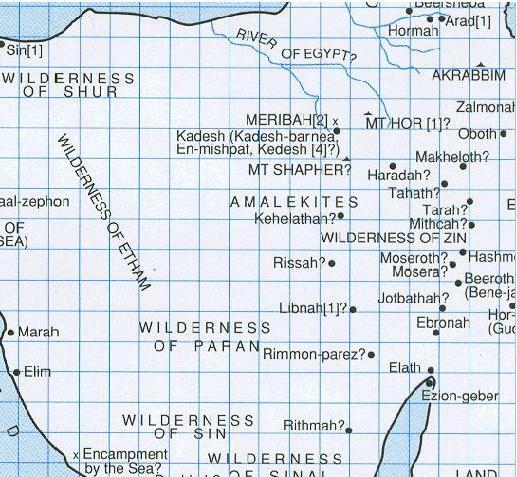 The map of Canaan, found in Atlas of the Bible, Carta, Jerusalem ISBN 965 220 345 9. The boundaries of this territory of Canaan corresponds closely to those given to Moses in Numbers 34: 3 "`Your southern side will include some of the Desert of Zin along the border of Edom. On the east, your southern boundary will start from the end of the Salt Sea, 4 cross south of Scorpion Pass, continue on to Zin and go south of Kadesh Barnea. Then it will go to Hazar Addar and over to Azmon, 5 where it will turn, join the Wadi of Egypt and end at the Sea. 6 "`Your western boundary will be the coast of the Great Sea. This will be your boundary on the west. 7 "`For your northern boundary, run a line from the Great Sea to Mount Hor 8 and from Mount Hor to Lebo Hamath. Then the boundary will go to Zedad, 9 continue to Ziphron and end at Hazar Enan. This will be your boundary on the north. 10 "`For your eastern boundary, run a line from Hazar Enan to Shepham. 11 The boundary will go down from Shepham to Riblah on the east side of Ain and continue along the slopes east of the Sea of Kinnereth. 12 Then the boundary will go down along the Jordan and end at the Salt Sea. Note that territory on the east bank of the Jordan isn't included in this demarcation. The next time God spoke to Abram about the land meant for his descendants, was after he had moved north from the Negev to a place between Bethel and Aiin, a mountainous area (later of Judea). It was here that God said to Abram, "Lift up your eyes from where you are and look north and south, east and west. 15 All the land that you see I will give to you and your offspring forever (Genesis 13:14-15). Since Abram's vantage point was a high area, he must have been able to look well over the Jordan River on the east, claiming the area by being able to see it. It did, in fact later become the tribal areas of Gad, Reuben and Manasseh. 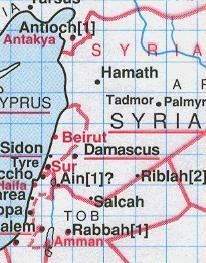 Note that Aroer, destined for desolation in Isaiah 17:2, is included in Reuben's territory (Jordan today). Consequently, this area will revert back to Israel after the fulfillment of Isaiah 17. It might be an ongoing fulfillment of Balaam's prophesy in Numbers 24:15: Then he uttered his oracle: "...17 A star will come out of Jacob; a scepter will rise out of Israel. He will crush the foreheads of Moab, the skulls of all the sons of Sheth. 18 Edom will be conquered; Seir, his enemy, will be conquered, but Israel will grow strong. 19 A ruler will come out of Jacob and destroy the survivors of the city." Zechariah 10:10 gives an indication of how far the Promised Land will to the north and north east. "I will bring them back from Egypt and gather them from Assyria. I will bring them to Gilead and Lebanon, and there will not be room enough for them. 11 They will pass through the sea of trouble; the surging sea will be subdued and all the depths of the Nile will dry up. Assyria's pride will be brought down and Egypt's scepter will pass away. 12 I will strengthen them in the LORD and in his name they will walk," declares the LORD. 11:1 Open your doors, O Lebanon, so that fire may devour your cedars." Lebanon actually seems not to have been as well defined as it is today. This fact is also reflected in Deutoronomy 1:7 "Break camp and advance into the hill country of the Amorites; go to all the neighboring peoples in the Arabah, in the mountains, in the western foothills, in the Negev and along the coast, to the land of the Canaanites and to Lebanon, as far as the great river, the Euphrates. 8 See, I have given you this land. Go in and take possession of the land that the LORD swore he would give to your fathers--to Abraham, Isaac and Jacob--and to their descendants after them." From this reference to Lebanon, it is clear that the present country of Lebanon, will eventually disappear and become Israeli territory. Let's get ahead of ourselves, and mention that the eventual territorial area of Israel will roughly comprise the areas occupied by the 10 nations mentioned in Genesis 15:19-21: ...the Kenites, Kenizzites, Kadmonites, Hittites, Perizzites, Rephaites, Amorites, Canaanites, Girgashites and Jebusites. 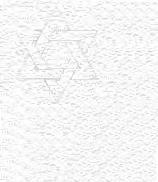 The best indication of the eventual area of Israel can be determined if one could demarcate to areas of the above ten nations. This demarcation will be done in the table below that is divided into blocks representing areas east and west of the Jordan River. 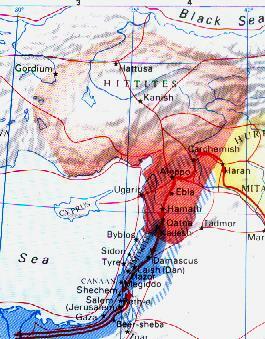 Lebanon Hittites and of the Arameans. The Kenites: Numbers 24:" 21 Then he saw the Kenites and uttered his oracle: "Your dwelling place is secure, your nest is set in a rock; 22 yet you Kenites will be destroyed when Asshur takes you captive." The Hittites: The lived in the Hebron area at the time of Abraham: Genesis 25:9 His sons Isaac and Ishmael buried him in the cave of Machpelah near Mamre, in the field of Ephron son of Zohar the Hittite, 10 the field Abraham had bought from the Hittites. There Abraham was buried with his wife Sarah. Later, however, they were shown to live an the area stretching from Damascus, northwards; Turkey today. This can be seen in the map on the left. 2 Chronicles 1:16 Solomon's horses were imported from Egypt and from Kue--the royal merchants purchased them from Kue. 17 They imported a chariot from Egypt for six hundred shekels of silver, and a horse for a hundred and fifty. They also exported them to all the kings of the Hittites and of the Arameans. Genesis 13:7 And quarreling arose between Abram's herdsmen and the herdsmen of Lot. The Canaanites and Perizzites were also living in the land at that time. ...16 In the fourth generation your descendants will come back here, for the sin of the Amorites has not yet reached its full measure." Deuteronomy 7:1 When the LORD your God brings you into the land you are entering to possess and drives out before you many nations--the Hittites, Girgashites, Amorites, Canaanites, Perizzites, Hivites and Jebusites, seven nations larger and stronger than you-- 2 and when the LORD your God has delivered them over to you and you have defeated them, then you must destroy them totally. Make no treaty with them, and show them no mercy. 1 Kings 9:20 All the people left from the Amorites, Hittites, Perizzites, Hivites and Jebusites (these peoples were not Israelites), 21 that is, their descendants remaining in the land, whom the Israelites could not exterminate--these Solomon conscripted for his slave labor force, as it is to this day. The Amalekites were not mentioned among the nations whose land was to become part of Israel, but they were among the nations Israel had to fight for land. 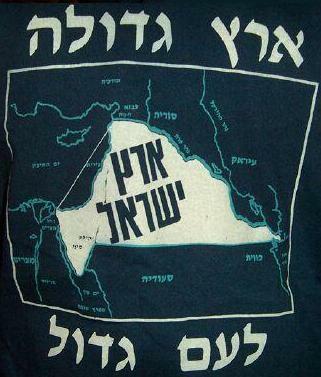 We will see from the discussion below that that they were associated with the mountains of Judea north (Ephraim) & west of the Dead Sea and areas further south of the Wadi-el-Arish and west towards Egypt in the Wilderness of Shur, that indicates flexibility concerning Israel's southern boundary. It is also of interest to note that the mountains of Paran are the source of the "River of Egypt" (Wadi-el-Arish) - Adam Clarke's Commentary.